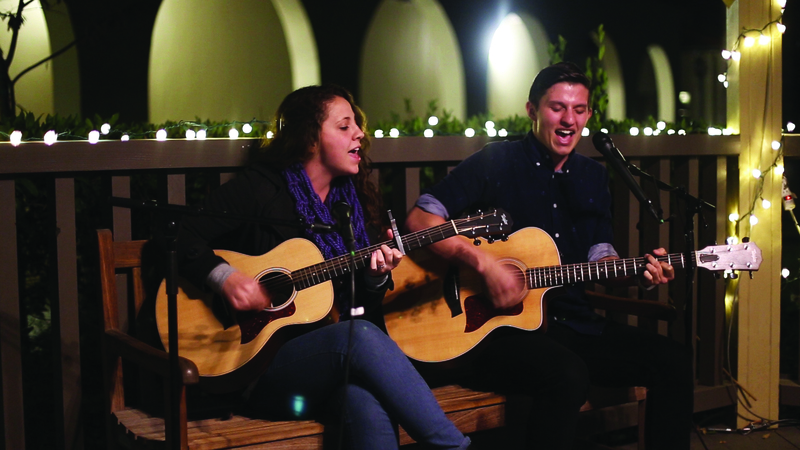 Jake Roque, sophomore business administration major, and Tayler Lanning, sophomore marketing major, performed for the first Newsroom Session of the year presented by The Banner on Jan. 15. Click here to watch the video. Unlike past sessions, which are typically held in The Banner newsroom, this was held in the gazebo in Harden Square near the ceramics building. Roque handled the majority of the hip-hop-style lyrics and Lanning contributed harmonies to the choruses. The duo also shared a cover of Jennifer Lawrence’s “The Hanging Tree” from “The Hunger Games: Mockingjay,” which they first debuted on Roque’s YouTube channel the day after the film’s release. Roque attended the film’s midnight premiere the Office of Community Life organized for California Baptist University students in November. He said his friend was humming “The Hanging Tree” after the show, which sparked his idea to cover the song. “I thought, ‘What if I just covered this song and when people go to look it up online they’re gonna find our version?’” Roque said. He immediately shared the idea with Lanning, and the two created an arrangement of the song and then recorded and posted it to Youtube. Within hours of posting the cover, the video received 30,000 views. Two months later it has garnered even more attention, with nearly 400,000 views and has been picked up by BuzzFeed, iTunes and Spotify. Roque concluded the Newsroom Session with a solo cover of “Jesus, Jesus” by the folk singer-songwriter Noah Gundersen. “Noah Gundersen has really deep lyrics that make you think about things that maybe you hadn’t thought about before,” Roque said. Roque is in the process of writing and recording an original EP, which he plans to release in April or May. Find the Newsroom Sessions at cbubanner.com.